I’m writing to let all authors, poets, musicians, painters, and any artist types that I forgot! The Community Storyboard is a new and exciting blog where you can submit your work and have it showcased. You can get important feedback and make friends with other artists. Aside from submissions, we are going to be doing a few prompts and weekly themes that you can use for some spontaneous creations. This entry was posted in Uncategorized and tagged acting, art, artists, authors, community, drawing, fiction, fun, music, musicians, nonfiction, painters, poetry, poets, sculpting, sculptors, singing, writers, writing. Bookmark the permalink. 23 Responses to Calling All Artists! Calling All Artists! If you want to submit here is the place and now is the time. Great opportunity for authors, poets, musicians, artists to contribute to a community blog. You’re welcome. Feel free to reblog and help spread the word. 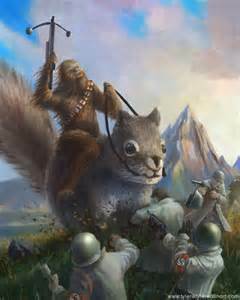 Needed to get people’s attention and it was the first thing I found when I wrote ‘Squirrel Artist’ into a Yahoo Image Search. Thanks. The picture is definitely a wonder of the Internet. Do we just send the submissions here? Do you have any kind of rules for the submissions? IE- flash fiction, poetry, short story, etc… I’d love to try this out. I’m always trying to improve and get feedback! The link on the name will bring you to the submission rules and form. The editors will read it over and post it once we check it over. Flash fiction, poetry, and short stories are happily accepted. Writers, artists, poets, musicians – this is for you! The Community Storyboard: Where Creativity Meets Community (and squirrels)! Here you go! Submit, all ye striving writers and artists! We review the submissions and post them after the review. It’s not an automatic posting. We need to make sure submissions meet the guidelines. Sorry about not clarifying that.